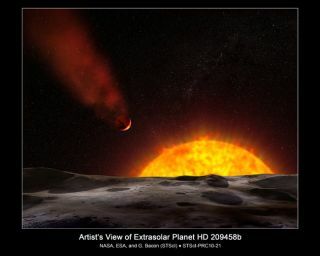 Artist's view of extrasolar planet HD 209458b. Astronomers using NASA's Hubble Space Telescope have confirmed the existence of a baked object that could be called a "cometary planet." The gas giant planet, named HD 209458b, is orbiting so close to its star that its heated atmosphere is escaping into space. Observations taken with Hubble's Cosmic Origins Spectrograph (COS) suggest powerful stellar winds are sweeping the cast-off atmospheric material behind the scorched planet and shaping it into a comet-like tail. A scorched alien planet is flying so close to its parent starthat its atmosphere is being swept off it in a glowing tail like some sort ofgiant comet, NASA announced Thursday. The existence of the planet and its strange tail, which wassuggested in previousstudies, was confirmed recently by NASA's Hubble Space Telescope. These newobservations of the gas giant planet, called HD 209458b, suggest strong windsfrom its nearby star are blowing the atmosphere off the scorched world andshaping it into a comet-liketail. "Since 2003 scientists have theorized the lost mass isbeing pushed back into a tail, and they have even calculated what it lookslike," said astronomer Jeffrey Linsky of the University of Colorado inBoulder, leader of the study. "We think we have the best observationalevidence to support that theory. We have measured gas coming off the planet atspecific speeds, some coming toward Earth. The most likely interpretation isthat we have measured the velocity of material in a tail." At such close quarters with its star, HD 209458b'satmosphere is a scorching 2,000 degrees Fahrenheit (1,093 Celsius). Paststudies have suggested that it is losing about 10,000 tons of gas every secondas material is blown off by its parent star. Eventually, it might be strippedentirely of its gas envelope, leaving behind a liquid core of lava. Even so, itwill be a long while before the planet is completely destroyed. "It will take about a trillion years for the planet toevaporate," Linsky said. The planet is located 153 light-years from Earth. This worldwas the first of the few known extrasolarplanets that seen to be passing in front of, or transiting,their stars. The existence of HD 209458b was first suggested in 1999.Subsequent studies found indications of oxygen and carbon in its atmosphere.More recently, it became the first alien world outside our solar system foundto have water. To date, astronomers have found more than 400 extrasolarplanets using the transiting method and by studying the wobble induced on starsby planets that orbit them. Linsky and his team used Hubble's Cosmic OriginsSpectrograph to analyze the planet's atmosphere during transiting events. Thisallows the astronomers to study the structure and chemical makeup of a planet'satmosphere by sampling the starlight that passes through it. The dip instarlight because of the planet's passage, excluding the atmosphere, is verysmall, only about 1.5 percent. When the atmosphere is added, the dip jumps to 8percent, indicating a bloated atmosphere. The data also showed the atmosphere escaping the planet wasnot all traveling at the same speed.
? "We found gas escaping at high velocities, with a largeamount of this gas flowing toward us at 22,000 miles per hour," Linskysaid. "This large gas flow is likely gas swept up by the stellar wind toform the comet-like tail trailing the planet." ?Editor's note: a typo has been corrected to reflect the fact that astronomers, not astronauts, have discovered exploplanets.